Recorded 1948-1954. No recording venues given but mainly derived from radio broadcasts. Various orchestral and piano accompanists. Giacomo CARISSIMI (1605-1674): Vittoria mio core! Vous me quittez?...Malheureux! Tu ne comprends done pas...O dieu, de quelle ivresse. In the garden near the ford. Op. 46, No. 4. Not a word, o my friend, Op. 6, No. 2. The extensive booklet notes which run from p. 9 to p. 33 take the reader through Zara Dolukhanova�s biographical details. This is followed by a commentary by Larry Friedman on the contents of these four CDs. Born in Moscow of Armenian parents she made her debut in 1939 at age 21 as Siebel (Faust). This was just as the thunder of guns was coming to dominate Europe, and Russia in particular, for the second time in little over a generation. In 1948 Dolukhanova became a soloist for the All Russian Radio remaining there for six years before taking a like position with the Moscow Philharmonic Society. During these periods she honed her skills in a wide range of Russian songs. These can be heard on the second part of CD 3 and the whole of CD 4. In 1951 there was the award of the Stalin Prize after which she gave many guest performances abroad. The guest performances took her to thirty different countries and perhaps stimulated her desire to sing in a wide variety of different languages although her reputation was first and foremost as an interpreter of Russian and Soviet composers. Dolukhanova aroused wide interest and enthusiasm at her New York debut in May 1959. In her forties the singer, unusually, changed her fach upwards to soprano and took on lyrico-dramatic roles such as Norma, Aida, Tosca and Butterfly. In 1969 she sang Puccini�s Suor Angelica at the work�s Russian premiere. Now, in her mid-eighties, she teaches at the Gnessin Russian Musical Academy. These four discs cover a wide diversity of repertoire and languages. The opening Arie Antiche (CD 1 trs. 1-6) start well (tr. 1) with Dolukhanova exhibiting a full-toned creamy mezzo voice in a well recorded natural acoustic. She sings this aria with smooth legato and expression although her good Italian has an unmistakable Slavic production. The slower tempo of the second piece, in which she adopts a hollow tone, stretches her legato at times. In the well-known Caro mio ben (tr. 4) the conductor�s tempi are far too slow for my taste but the singer comfortably encompasses the bars of higher tessitura. As indicated these arias are sung in the original Italian. The following two pieces, Verdi�s Ave Maria (tr. 7) and Mozart�s Exultate jubilate (tr. 8) are sung in Latin and leave entirely different impressions one with the other. The Verdi, with its echoes of Desdemona�s prayer in act 4 of Otello, is sung with a good variety of expression and tone; a very satisfying rendition. The Mozart on the other hand leaves me flummoxed. Dolukhanova adopts a light girlish tone depriving the voice of substance. This is a soprano coloratura aria. Her coloratura is sketchy and her interpretation stylistically idiosyncratic. My ear finds the same stylistic faults in the succeeding Mozart arias (trs 9-12) and the extract from Cosi (tr. 13). The Russian language doesn�t help interpretation here even in those pieces composed to a German text. In the lieder of Schumann and Schubert (CD 2 trs. 1-14) Dolukhanova brings excellent tonal control and expression with the Russian being less of a problem. Stylistically the piano accompaniment is appropriate and this contributes to the satisfactory realisation of the songs in a language other than the original. I found Seit ich (tr. 1) and the brio she brings to Wohin (tr. 12) particularly appealing. The excerpts of French origin (trs. 19-21) suffer from the language problem, which should not hide the fact that Dolukhanova could gainfully have brought richer tone to Giulietta�s contribution to the Hoffmann duet (tr. 19). To compensate, her Core �ngato is heartfelt, expressive and vocally appealing. The third disc starts (tr. 1) with the haunting Kaddish, the Jewish prayer for the dead. Here Dolukhanova�s even tone adds to the effect. In the vibrant rhythmics of the first two of de Falla�s eight popular Spanish songs (trs. 2 and 3) only the singer�s accent detracts from complete enjoyment of her tone, expression and interpretation. The more contemplative Asturiana (tr. 4) is particularly well sung with a variety of vocal colour. Dolukhanova�s use of colour and expression in the Wolf songs (trs. 9-13), and with the Russian sound less intrusive, is also impressive. The voice here is set a little further back on the sound-stage than in the previous extracts. The Strauss songs (trs. 14-19) are accompanied by the piano. She sings Morgen (tr. 17) with clear tone and smooth legato. If I miss the nuances of Schwarzkopf or Norman, with orchestral support, it is may be my familiarity with the compositional language in those recordings more than the singer�s limitations here. There is no such reservation in respect of the final tracks (23-32) of this disc and the whole of CD 4. It is these tracks, which, above all, will justify the purchase of this issue. This is the repertoire that Dolukhanova performed regularly on radio and took on her foreign tours. On all these 35 tracks we can hear a consummate artist in her specialist field. Although in the recording notes (p.34) Richard Caniell makes apology for some print through and deficient signal to noise ratio, prospective purchasers need not worry. The sound is eminently presentable with Dolukhanova�s voice always well caught in a clear acoustic. Despite some idiosyncrasies of style in the Mozart and the predominance of the Russian language this diverse collection should appeal to all lovers of singing. Whether out in the market-place other than specialist collectors will buy into 4 CDs of a relatively unknown singer remains to be seen. 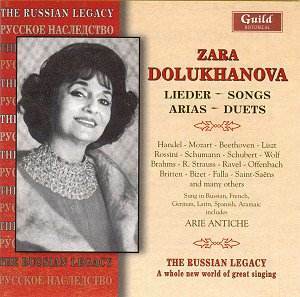 A two-disc issue of the Russian songs together with a sample of Dolukhanova�s Schubert, Schumann and Wolf might have had more appeal.